Do check the shelving capacity. All Quantum shelves offer a weight capacity of 600 or 800 lbs. 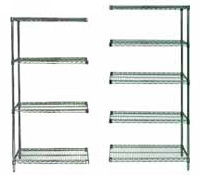 Ensure the listed shelving capacity is listed per shelf, not the total shelving rack capacity. Do check for warranty information. Quantum stainless steel shelving features a lifetime warranty, green epoxy has a 15-year warranty and black epoxy has a 10-year warranty. Do get free shipping. No hidden freight or handling costs. Because of our great vendor relationships, you get free shipping included without inflated prices, handling, or freight fees. Free Shipping on all Quantum Wire Shelving Orders! 54" height green wire add-on unit. Consists of 2 posts and your choice of 4 or 5 shelves. 63" height green wire add-on unit. Consists of 2 posts and your choice of 4 or 5 shelves. 74" height green wire add-on unit. Consists of 2 posts and your choice of 4 or 5 shelves. 86" height green wire add-on unit. Consists of 2 posts and your choice of 4 or 5 shelves.